Nationality: American. Born: Joseph Aloysius Dwan in Toronto, Canada, 3 April 1885; family moved to United States, 1893. Education: North Division High School, Chicago; Notre Dame University, Indiana, degree in electrical engineering, 1907. Family: Married 1) Pauline Bush, 1915 (divorced 1920); 2) Marie Shelton, early 1920s (died 1954). Career: As illuminating engineer work on mercury vapor arc light led to association with Essanay film company, 1909; wrote stories while supervising lighting; American Film Company ("Flying A") formed by Essanay staff, Dwan joined as chief scenario editor, 1910; signed to Universal Pictures, 1913; signed with Famous Players Company, New York, 1914; joined Triangle Company under supervision of D.W. Griffith, 1915; worked in England, 1932–34; trained camera units for U.S. Armed Services photographic division, 1943; contracted to Republic Pictures, 1945–54. Died: In Woodland Hills, California, 21 December 1981. Interview with F.T. Pope, in Photoplay (New York), September 1923. "Must Actors Have Temperament?" in Motion Picture (New York), February 1926. "As It Was," in Making Films (New York), June 1971. "What Directors Are Saying," in Action (Los Angeles), August 1971. "Angel in Exile: Alan Dwan," interview with G. Morris and H. Mandelbaum, in Bright Lights (Los Angeles), no. 4, 1979. Brownlow, Kevin, The Parade's Gone By , London and New York, 1968. Bogdanovich, Peter, Allan Dwan, the Last Pioneer , New York, 1971. Smith, J.M., "Allan Dwan," in Brighton Film Review , February 1970. Schickel, Richard, "Good Days, Good Years," in Harper's (New York), October 1970. "Six Pioneers," in Action (Los Angeles), November/December 1972. Dorr, J.H., "Allan Dwan: Master of the American Folk Art of Filmmaking," in Take One (Montreal), September 1973. Dorr, J., "The Griffith Tradition," in Film Comment (New York), March/April 1974. Biette, J.C., "Allan Dwan, ou le cinéma nature," in Cahiers du Cinéma (Paris), February 1982. McGillivray, D., obituary, in Films and Filming (London), March 1982. Fornara, B., "Allan Dwan," in Cineforum (Bergamo), May 1991. Allan Dwan was a pioneer among pioneers. He, along with men like D.W. Griffith and Cecil B. DeMille, enjoyed careers that spanned the birth and the growth of the American motion picture industry. Active in the industry for over fifty years, Dwan participated in creating at least eight hundred films—his own estimate was 1,850. Most of these were one- to four-reel silents, of which some two-thirds are lost, and for that reason his career remains one which has never been properly assessed. The artistic disparity of his seventy-odd sound films fail to adequately represent this technically innovative, unpretentious, avid storyteller, and his career will surely undergo considerable re-evaluation as the study of film history progresses. It was the scientific aspect of motion pictures that first attracted Dwan to the medium, and in 1909 he joined Essanay as a lighting man. He then joined the American Flying A Company as a writer, but soon found himself directing short films, mostly Westerns. He moved next to Universal, then to Famous Players, where in 1915 he introduced the dolly shot for David Harum and directed Mary Pickford in The Foundling. That same year Dwan joined Fine Arts-Triangle, where his films were supervised by D.W. Griffith. He directed many of Griffith's top stars, including Dorothy Gish in Betty of Greystone and her sister Lillian in An Innocent Magdalene. He once stated how impressed he was with the "economy of gesture" of Griffith's players. He credits Griffith with developing his clean, spare visual style, while Griffith frequently sought out Dwan for his technical knowledge. One such request resulted in Dwan's improvising an elevator on a moving track to film the massive sets of Intolerance. Dwan also established his association with Douglas Fairbanks at Fine Arts-Triangle. This professional relationship resulted in collaboration on eleven films, including The Half-Breed, A Modern Musketeer, Bound in Morocco , and the celebrated Robin Hood , described by Robert Sherwood as "the high-water mark of film production" and "the farthest step that the silent drama has ever taken along the high road to art." 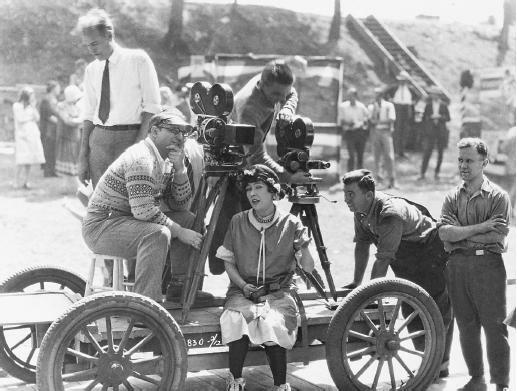 In 1923 Dwan directed his favorite film, Big Brother , which was about underprivileged boys, and then embarked on the first of eight buoyant comedies starring Gloria Swanson, the best of which were Zaza and Manhandled. With the arrival of sound, Dwan signed a long-term contract with Fox (1930–41), where he was unfortunately relegated to their B unit except for occasional reprieves—Shirley Temple's Heidi and Rebecca of Sunnybrook Farm , and Suez , much admired for its typhoon sequence. He then signed with producer Edward Small, for whom he directed a delightful quartet of farces— Up in Mabel's Room, Getting Gertie's Garter, Abroad with Two Yanks , and Brewster's Millions. He then unwisely signed an exclusive deal with Republic Pictures where, except for Sands of Iwo Jima , his creativity was constricted by studio head Herbert Yates. Moving to RKO, he persevered despite the many obstacles of 1950s filmmaking, churning out entertaining action films. Dwan loved moviemaking and was described as the "last of the journeyman filmmakers" by Richard Roud. Of his self-imposed retirement in 1958, Dwan explained: "It was no longer a question of 'Let's get a bunch of people together and make a picture.' It's just a business that I stood as long as I could and I got out of it when I couldn't stand it any more."